QUESTION: I’m a reader from China and one of the big fans of you in our country. I want to ask you a question and would be very happy to get your reply. If my memories are correct, you have been a bull of China and praised Chinese leaders for their competence. But in reality, Chinese people are very disapproval of the government, to be more exactly, hate and curse! As you know, aside from problems of severe pollution and food safety,China has a very big housing bubble and the price is well beyond people’s purchasing power. Many young people had to use their parent’s retirement savings or even borrow the rest from relatives as down payment to buy an apartment so they can get married. On the other hand, most Chinese public servants have many many suites of apartment——to hide their bribery money in many cases. Corruption is widespread in China, everywhere. People are yearning for democracy and election, and not trust one-party politics anymore. Also, many people are expecting a crash of china’s housing market. Sadly enough, they have been expecting for many years but the price just won’t stop rising. So, what’s your opinion, about china’s politics and housing market? I will be very eager to wait for your answer. Thank you very much. ANSWER: Politicians in the USA like to point their collective finger at China for corruption problems while they sanction a legalized system of corruption that ensured the NY bankers will NEVER be prosecuted. Furthermore, in the USA, politicians receive untold millions legally funneled to them by political action committees. The PACs assure that Congress votes the way that those who provide the money want it to. Why is Goldman Sachs above the law? They bought both parties equally. Rubin took charge of the Treasury under Clinton and did away with Glass-Steagall. Paulson took over the Treasury from him and eliminated Lehman and Bear Stearns, but as soon as Goldman’s was getting shorted he outlawed short selling. Nobody in Congress will even investigate Goldman Sachs because they have their hand out under the pretense it is LEGAL. China should just LEGALIZE the corruption like it is done in all GOOD upstanding Democracies and it will not be an issue regardless what goes on. All government is what it is. The ONLY form of government that seems to work is the benevolent dictator. But that is rare. Give people power and they all go nuts no matter what form of government. So the people can yearn for democracy, but it will be no better. Where the government of China deserves credit is they saw Communism failed, they changed course without a revolution after Tenamin Square, whereas we have Homeland Security buying tanks for domestic use and 1.6 billion bullets enough to shoot every American 5 times. 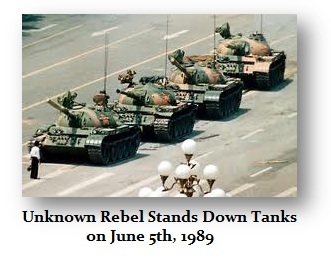 I wonder if when their tanks roll down our streets, will they stop as they did in Beijing? 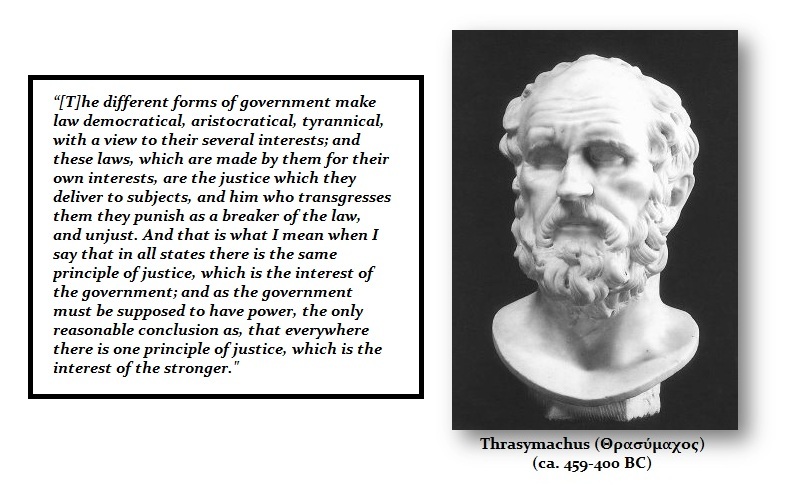 So when it comes to government, on this score, I and with Thrasymachus. I see no difference between left or right, the names employed, or the pretended form. It is always just their issue of self-survival. So be very careful what you wish for. Without eliminating a system run by CAREER politicians, there will never be any REAL change in corruption. As far as the economy some housing prices may have bottomed in 2012. Keep in mind hat it is volatile and that prices were rising from an extremely low level. The government has taken steps to try to suppress the cycle unlike in the United States. The 2010 reforms were. The down payment for first-time buyers’ mortgages was increased to 30% from 20%, while for second homes down payment rose to 60% from 50%. Mortgages for third home purchases were prohibited. There were limitations on home purchases in more areas, credit-quota limits and higher benchmark lending rates. New property taxes were introduced in Shanghai and Chongqing – between 0.4% and 0.6% in Shanghai, and between 0.5% and 1.2% on luxury homes and newly purchased high-end homes in Chongqing, plus a special tax on second home purchases by people with no business or employment interest in the city. In early-2011, Beijing also banned property purchase to those who have not lived in the province for five years, limited the number of homes a native Beijing family could own to two, and allowed only one home for non-native Beijing families. Mortgage discount for first-time homebuyers was eliminated. The benchmark interest rate was raised to 6.56% in July 2011, the third interest rate hike last year. Keep in mind that these measures would NEVER have been taken in the United States when politicians need to be elected. There is always two-sides to a coin. Some of the steps taken in Singapore trying to suppress the real estate boom there once again were sound measures that would never be imposed by elected politicians. Prices on a percentage basis historically rise more rapidly and sales are at record highs when first beginning in a national cycle. During the land bubble in the United States that burst in 1836 and led to the Panic of 1837, saw 1.2 million acres sold in 1829 at $1.5 million amounting to 80 cents and acre. 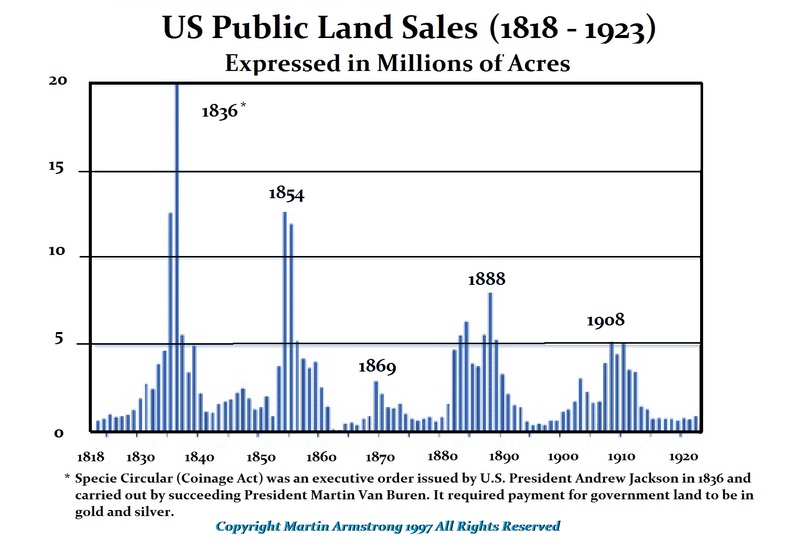 At the peak in 1836, the government sold 20 million acres at $25 million at still 80 cents. Land speculation was dominant. What caused the bubble to burst was the Specie Circular demanding payment in gold and silver. The Act of 1820 stopped the government financing the land decreeing that the land had to be paid in cash, which was simply banknotes. This only made the banks now the lender so the bubble continued. The politicians failed to create a market economy and wanted to be seen as generous selling land at 80 cents and acre. Speculative market were booming and in some cases land prices reached $2.50. This created a real estate bubble that became nationwide. Mobile saw the land value of the city jump from $1.3 million to $27.5 million between 1831 to 1837. New York City doubled in value from $300 million to $600 million. The government surplus jumped from $8.1 million to $19.9 million annually between 1829 to 1836. The government couldn’t possibly lower taxes fast enough or low enough to prevent budget surpluses even at 80 cents. Keep in mind it is not a bubble merely because of price. Who wouldn’t pay $3 an acre today for what was a bubble in 1836. It is a bubble because of TIME, not price. We are gathering all the data possible of the real estate in China because it is important to see when the bubble will burst. Second hand house prices are rising. So this requires close attention. One concern is we reached 23 years from 1989. The 26 year target would be 2015. It will not continue beyond that target in TIME.